So I know the last recipe I posted also featured chocolate, and well, cookies. This wasn’t intentional all. They may look (sort of alike), but I assure you, they’re quite different! You see, last weekend I had a hankering for peanut butter cookies. My peanut butter cravings get fed daily by a tiny spoonful of it daily, but this craving was for peanut butter in cookie form. 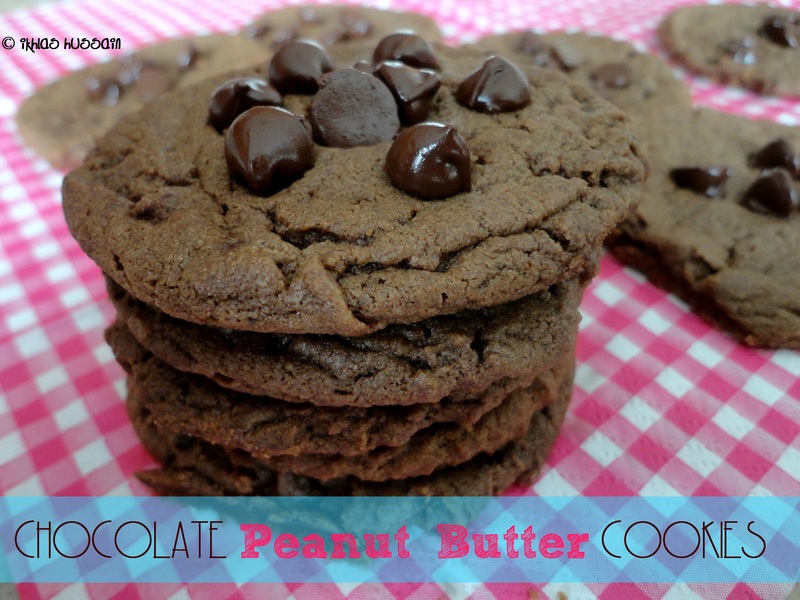 And what a better cookie recipe that fed both my chocolate AND peanut butter cravings. It was a win-win! Soft and chewy, they have a rich, velvety taste that requires you to dunk them in a tall glass of ice-cold milk. So deep and delicious, these Chocolate Peanut Butter Cookies are perfect for the biggest chocolate+peanut butter craving. Check them out! In the bowl of your stand mixer, add first 5 ingredients (everything except chocolate chips) and mix well for a few minutes. When a rough dough forms, scrape down the sides of the bowl and continue mixing until everything is mixed in. Refrigerate for an hour or more. Preheat oven to 350 degrees F, and scoop out dough into balls, roughly an inch wide. With the bottom of a glass, flatten cookies out. Sprinkle with a few chocolate chips on top and bake for 8 minutes. Let cool completely before before enjoying. Store in an airtight container. Recipe inspired by Tasty Kitchen. The cookies will be quite puffy, and rather soft when they come out of the oven. They might even look undone, but leave them to cool for at least 5 minutes. I couldn’t wait to try them once they came out of the oven and one of them started falling apart in my hands because it wasn’t completely ready. So let them cool completely! I love the combination of chocolate and peanut butter (who doesn’t?! 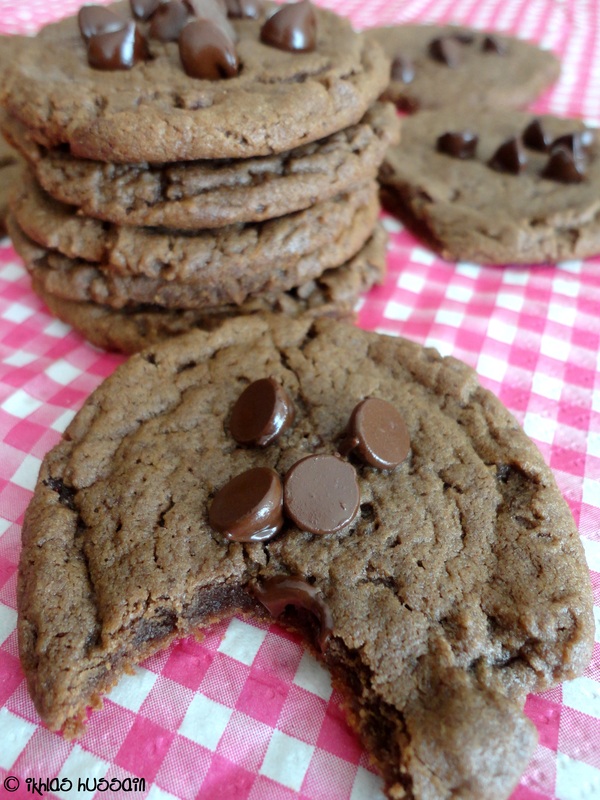 ), and this recipe is a great way to combine both flavours into a cookie. You’ve got the somewhat nutty flavour of peanut butter with the richness of the unsweetened cocoa powder. 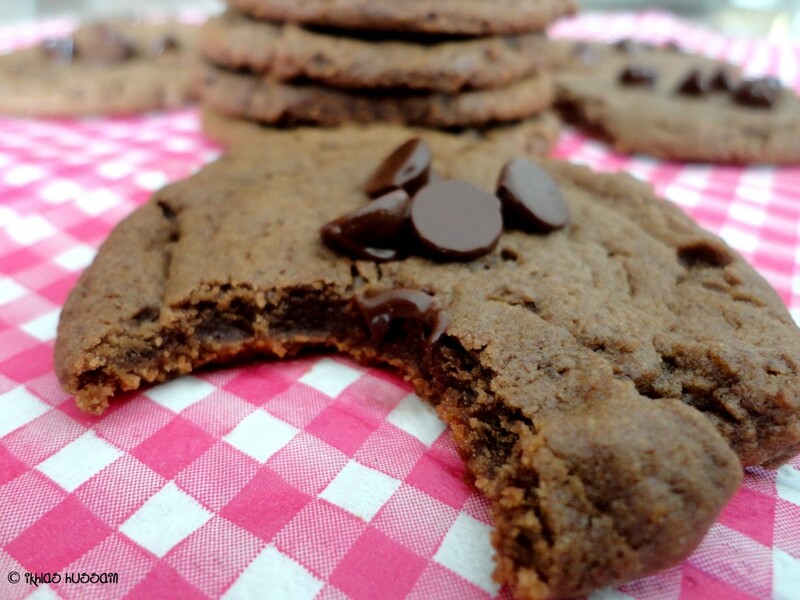 The brown sugar makes these cookies so irresistibly soft and chewy. 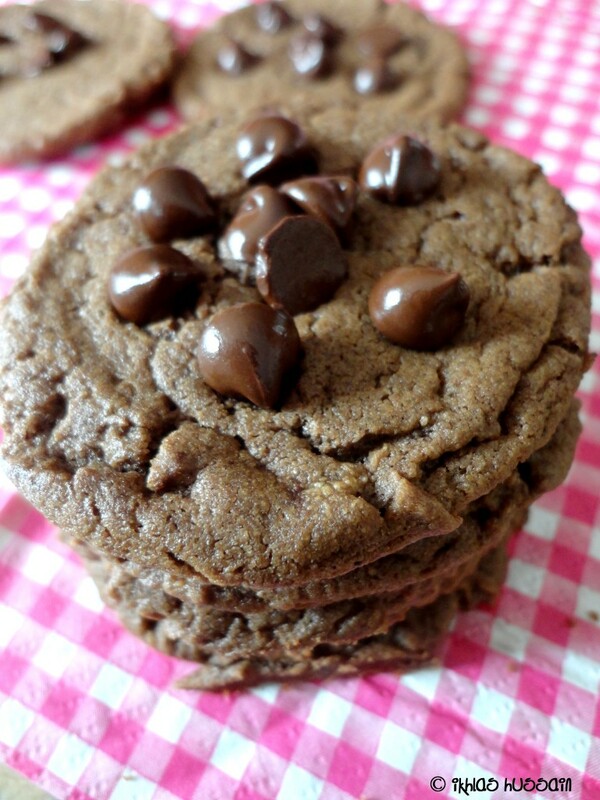 With warm, melty chocolate chips on top, these cookies pretty much melt in your mouth. An instant classic, these Chocolate Peanut Butter Cookies only take about 5 minutes to prepare, and then the fridge and oven do the rest for you! These were so easy to make and didn’t require any fancy ingredients or methods; I know that I’ll be making them again quite soon when my chocolate+peanut butter craving hits! If you love chocolate and peanut butter, you’ve got to make these cookies…you won’t be sorry! I love anything and everything having to do with peanut butter & chocolate. 🙂 These cookies look wonderful! And you can’t beat such an easy cookie. Love these! sally @ sallys baking addiction recently posted…Homemade Lemon Cupcakes with Vanilla Frosting. Is there anything better than chocolate and peanut butter in cookie form?! I doubt it…!